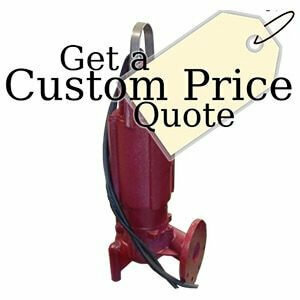 Home Pumps & Basins Non-Clog Pumps & Accessories 2-Vane Enclosed Impeller - 3 & 4 Inch Dis. Slip-Fit stator efficiently transfers heat to cast housing. Class F construction with overload protection in oil-filled chamber for cool operation and long motor life. 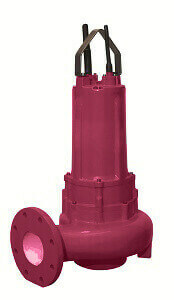 Motor / Pump shaft securely held with upper and lower ball bearings, plus additional sleeve bearing in lower seal chamber. Rated for 100,000 hour B-10 life. Dual silicon carbide mechanical shaft seals provide twice the moisture and grit protection for the motor. Dual seals are housed in a secondary oil-filled seal chamber. Tougher silicon carbide seals better handle sand, grit and abrasive materials. Highly efficient enclosed 2-vane impeller easily passes 3” diameter solids without blockage. The strong ductile iron impeller features backside pump-out vanes, keeping lower seal clean and pressure-compensated for longer life. Dynamically balanced for smooth, quiet operation and long bearing life.